Kick Starters – Instructional Kicking Program for Kids! This “fun learning” opportunity is FREE to participants and targets children ages 12 and under. 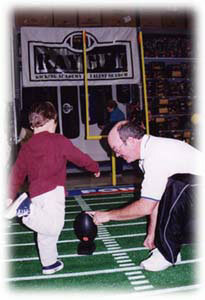 Kicking mini footballs on a scaled down football field will be an “impacting” experience for young beginners. EACH PARTICIPANT WILL RECEIVE A FREE “MINI” FOOTBALL!!! Call us at (606) 327-0051 to sign up today!!! 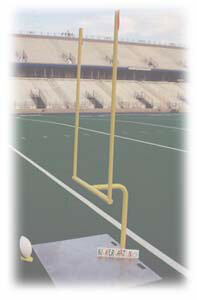 NOW YOU CAN PURCHASE YOUR VERY OWN “KICK STARTERS” GOAL POST SET!!! Comes complete with base, wind direction flags, kicking tee, mini football and a Kicking Game instructional book! KICK STARTERS comes in metal / plastic combination (metal base and cross bar with plastic uprights) or ALL plastic (PVC tubing) for $295. Contact us today to place your order!! !